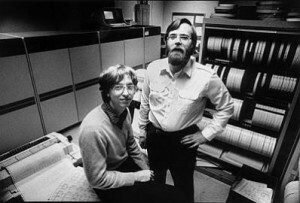 Microsoft is founded as a partnership between Bill Gates, age 19, and Paul Allen, age 22, in Albuquerque, New Mexico. The company is founded to develop BASIC for the MITS Altair 8800. MITS is headquartered in Albuquerque so Gates and Allen move there from Boston to launch their company. Eventually they decide to move Microsoft to the Seattle, Washington area, where both men were from originally and met in high school.